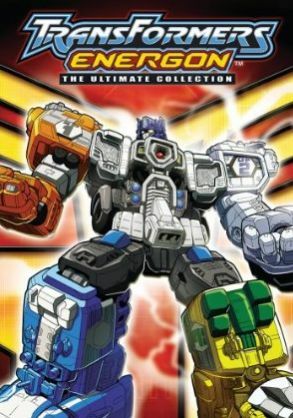 Transformers Energon is a sequel to the Transformers Armada series. Unlike Transformers Armada, the robots in Transformers Energon are all done with computer graphics, just like in the Transformers Energon sequal series, Transformers Cybertron. And if you remember my review of that series, you'll know that I really don't care for this too much. Not because the main characters are all CG and just don't seem to fit into the universe, but also because they are clunky looking which seriously impact the humanity which helps the audience connect with the characters. Along with that, the Transformer characters just don't look like badass robots. They look silly, like giant toys... and that's because they are. The robots look EXACTLY like the toys, as the wheels don't get hidden and the bodies don't get slender and more streamlined. Why do they do this? Remember the original Optimus Prime or the original Megatron from the show? They were cool looking robot characters in the cartoon! Remember the toys? They looked completely silly compared to their cartoon counterparts! Remember how wide Megatron's chest was? Remember how the gun muzzle went next to his hip instead of behind his back like in the cartoon? Limitations in the toys prevented them from transforming into the awesomeness of the real character designs... but that's no reason to make the character designs just as stupid as the limited toy designs. Just look at the 20th anniversary Optimus Prime toy, or the Masterpiece Megatron. Their robot forms look extremely similar to the cartoons. Okay, enough about that. Let's move on to the story. We start off 10 years after the conclusion of Transformers Armada. Megatron is dead, and the Decepticons have an uneasy truce with the Autobots, working together hand-in-hand like one big happy family to extract energy known as Energon, which is basically like lifeforce. And this part of it is pretty cool, seeing Autobots and Decepticons working together as allies, and yet still keeping some of that animosity that we all love. It's pretty safe to say the truce doesn't last forever, at least not for everyone, so we also get to see conflict over the choosing of sides. Autobots want to become Decepticons? Decepticons want to become Autobots? It's a cool scenario. You know what's not cool? The main human character of the show, a brash young teen named Kicker... and that's actually putting it lightly. This kid is truly an a-hole who you dislike almost immediately. Unfortunately, besides being the son of the famous Doctor Brian Jones, he also has the ability to sense Energon, which means they kinda need to keep him around. I'm not really sure if his attitude gets a little better or if it's just me getting used to him, but at first I just couldn't stand the guy, while later on he didn't seem so bad. Though I still never really like him. Putting aside all the stuff about the series I don't like, I actually did find the overall story arc pretty interesting. I don't want to give much of it away, so I'll just say that you'll meet a lot of characters from previous series, some directly from Transformers Armada, and some from other Transformers incarnations, but changed in various ways for this new series. And yeah, Unicron will be seen again! Sorry to spoil that, but Unicron is just so awesome. I also enjoyed having a third faction for conflict besides the Autobots and Decepticons. Yep, I'm talking about the Alpha Q. It's also nice to be able to watch the entire show all at once, instead of one week at a time. I think it helps to keep you interested, as if I was doing the weekly thing, I probably wouldn't care enough to keep watching. And there is plenty here to watch. There are no extra features, but that's okay consider how much show you actually get in this set (over 1000 minutes on 7 discs). Overall, I think Generation 1 fans will be disappointed with it, but for kids it's okay and it's a lot of show for the money.